You are here: Home » Holiday Spirit…on mini skis! 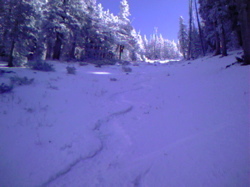 two days ago, i was again the first local to ski down our local ski area from top to bottom. this may not seem that great, i know. not even enough to cover the smallest of rocks. 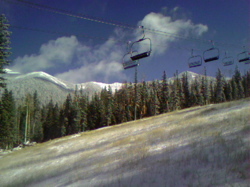 now, what kind of a WF Warrior would i be if i was afraid of a few (million) rocks to bother my enjoyment of skiing, eh? hey, welcome to Skiing in Arizona, baby! you gotta REALLY be creative if you are skier living here! wake up…see that the Peak has been Blessed with new snow…crank off Early Morning Ritual ™, prioritizing my “old faithful” routine; The Rock Vinyasa ™, which is a sure cure for overcoming a stiff lower back and freeing up the Power Chain Musculature of the hips (see my DL on the hips earlier this week)…with my internal engine pre-lubed with Pranayama, Meditation, and Rock Vinaysa, i took a few Action Caps, Sport Caps, Metabalance 44, and BioBuilde and i was Empty, Light, and RARING to go…like allWays! THANK YOU, WF! For being such a TREMENDOUS best friend! 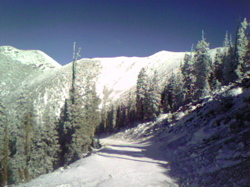 first headwall of my 2,635′ K’tooled ascent up the ski runs. if it were up to me? i’d vote for snowmaking in exchange for the ski lifts! who needs ski lifts? Snowshoe Thompson didn’t! neither does ilg! well, at least when i am training to defend Mt. Taylor Winter Quadrathlon titles! within 70 minutes i had plowed, stumbled, and floated up to the highest point of the ski area, the top of the Agassiz chairlift at 11,500′. this is the view looking toward Mt. Humphreys, the highest peak in the Grand Canyon State (according to the records i can find, i have the Ascent/Descent Record of this beast; just under two hours). Hey, the WF Path works because i have been field testing EVERYTHING i teach for a quarter century of elite performance; the SUNRIDER Herbs, the HP Yoga routines, the Strength Training Techniques, all of it, all of it, ALL of it was born and refined in these high cradles of the Mountain Gods. you get the Benefit! 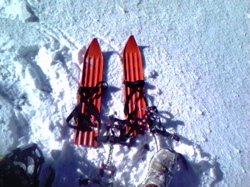 out of the running crampons and onto the MiniSkis!!! ahhhh!!! if only there was a World MiniSki Championships…i’d make the podium or die trying! go ahead… laugh at my tiny “kid skis” that i grew up on in Durango, Colorado as a child! you might be surprised at how efficient these little toys can be on the Steeps and the Shallows! you might find yourself hurtin’ trying to keep up with ol’ coach on these kiddie toys! LOVE IT!!!!! LAYIN’ DOWN (MiniSki) FIRST TRACKS…YEAH BABY!!!! who SAYS skiing ain’t good on the Sacred Peak these days? it is GREAT SKIING for a WF WARRIOR!